Posted in: Past News and Events. 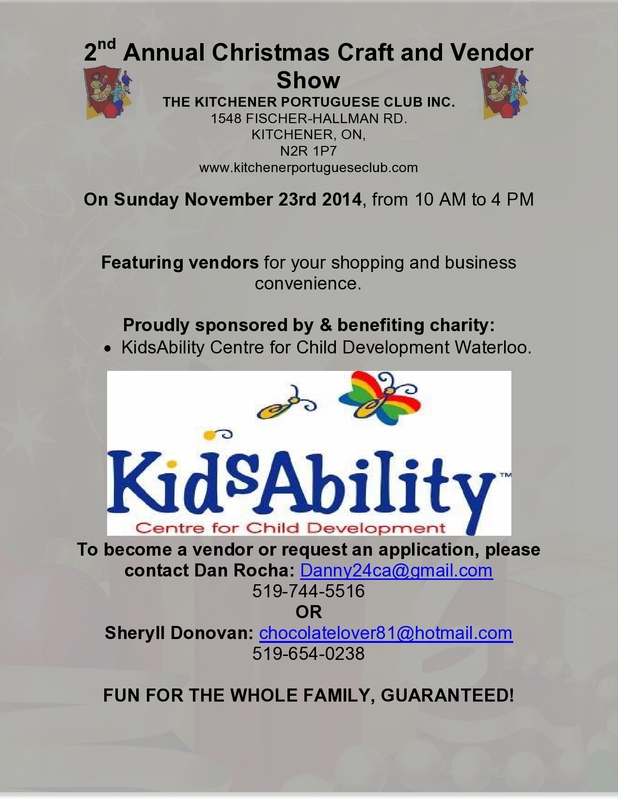 Tagged: 10am to 4pm, 2014, 23rd, club, Fundraiser, KidsAbility, kitchener, November, portuguese, Sunday. ON SUNDAY, NOV. 23RD 2014, FROM 10AM TO 4PM. Many vendors for your Christmas shopping pleasure. Proceeds will go to benefit: KidsAbility! TO BECOME A VENDOR, PLEASE CONTACT: ME: Dan Rocha, (Email: Danny24ca@gmail.com or Call: 519-744-5516) or Sheryll Donovan, (Email: chocolatelover81@hotmail.com or Call: 519-654-0238). Posted in: Past News and Events. Tagged: $5, 11th, 12pm, 1pm, 2014, 2:30pm, At, Atlantic, club, Dance, Day, Dessert, DJ, Door, Doors, kitchener, Lunch, May, Mother's, portuguese, potatoes, rice, salad, Scallopped, Soup, Sunday, Veal. Mother’s Day – Sun. May 11th, 2014 – Kitchener Portuguese Club. Menu: Soup, Salad, Scalloped Veal with Potatoes & Rice and Dessert. Prices: Members: $20 | Non-Members: $25 | Children: $10 | $5, just for the dance, around 2:30pm, at the door.